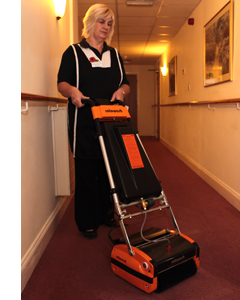 We have thousands of satisfied users in nursing and residential care homes thanks to the efficiency and quality of a Rotowash clean. Nasty odours are removed and carpets are left dry and free of soilage, upholding a healthy and hygienic home for residents and workers alike. Rotowash floor cleaners are recommended by Flotex, Anker, Ege, Weston, Hereforder and many other carpet manufacturers. We could not maintain the high cleaning standards at the home without the Rotowash machines. Also the staff absolutely love using them.